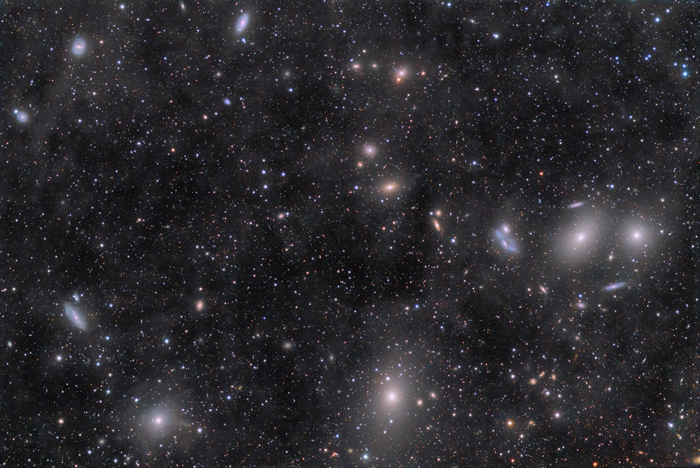 The image shows the central part of the Virgo Galaxy Cluster that contains about two thousand galaxies. The cluster, at about 50 million lightyeras distance, is the largest and the nearest galaxy cluster to our local group that is often also considered to lie on the fringes of the Virgo Cluster. 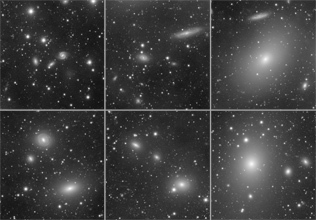 An irregular distribution of the X-ray halo of the area also suggestes that the Virgo Cluster is an aggregate of at least three sub-clusters, centred around M87, M86, and M49. 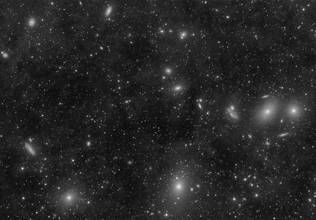 More on the interesting aspects of the Virgo Cluster can be found here. While processing the data, a very faint nebula started to get visible. Initially I thought this was foreground dust which belongs to our galaxy. However, I was told to have a look at this publication: Diffuse Light In The Virgo Cluster. Therefore, it is belived that most of the visible nebula structures are due to the galaxy interactions, also called diffuse intracluster light (ICL). One example of such an ICL can for example also be seen in this image, clearly showing the extended tidal stream produced by the galaxy interaction.